Gloria Valdes "Tarasca" is a self-taught artist who was born in Mexico. Her interest is in producing a group of portraits of people from various countries, decades, and professions. Among them are human rights activists, presidents, environmentalists, movie stars, musicians, beauty queens, scientists, athletes, painters etc. She wants to recognize them for the work they have done and the contribution they have made. She also wants to educate people about them. But the main reason is to inspire the new generation who have lost hope. Many of the people in her portraits have gone through difficult periods in their lives and decided to fight every day to accomplish their dreams. So far, Gloria has produced 52 portraits, but her ambition is to do 65. What all these personalities have in common is that they have made the world a better place in which to live. 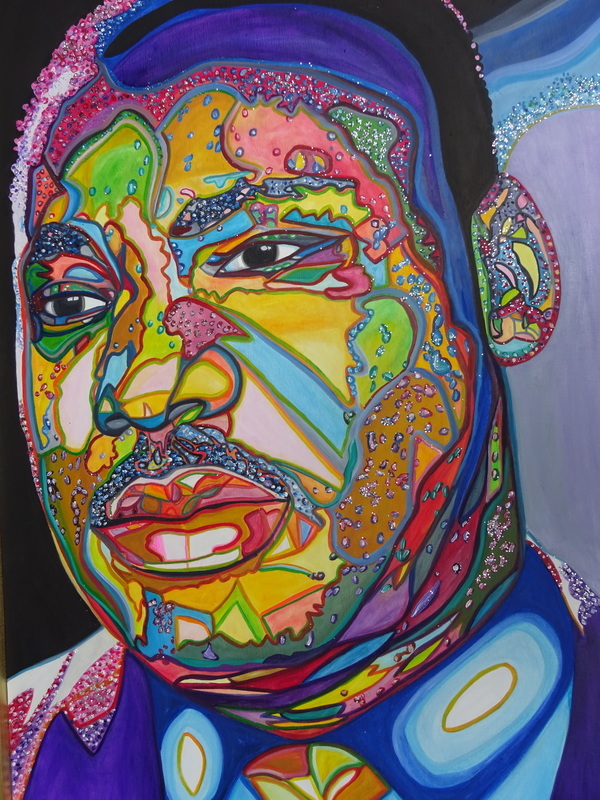 "Martin Luther King Jr. (1929-1968) was a baptist minister and activist who was a leader in the U.S. civil rights movement. This prominent social activist is a great example of intelligence and courage. He made a big difference in society and in many peoples' lives. He participated in several public protests and promoted non-violence. He did this to end segregation and racial discrimination and to end poverty. He also helped to end the Vietnam War and fought for voting rights. He was one of the most important leaders and heroes of this country. His best-known speech was "I have a dream." He said: "I have a dream that my four little children will one day live in a nation where they will not be judged by the color of their skin, but by the content of their character." In 1964 he won the Noble Peace Prize. He was posthumously awarded the Presidential Medal of Freedom and the Congressional Gold Medal. He is also recognized with a memorial monument on the National Mall in Washington, D.C. dedicated in 2011".